Image caption Chan fheumar a dhol tro thèarainnteachd aig na puirt-adhair thall le bhith a' cleachdadh na seirbheis. Thàinig a' chompanaidh adhair Flybe gu aonta le Aer Lingus a tha a' ciallachadh gum faodar siubhail às Inbhir Nis gu ruige phort-adhair ann an Aimeireaga a Tuath. Faodar falbh a New York, Orlando, agus Chicago anns an Stàitean Aonaichte, agus Toronto ann an Canada, le bhith a' siubhail taobh Bhaile Átha Cliath. Thòisich Flybe seirbheis eadar Inbhir Nis agus Baile Átha Cliath deireadh an Damhair, agus faodar a-niste a dhol air adhart thar a' Chuain Shiair le dìreach aon ticead às bho Inbhir Nis. 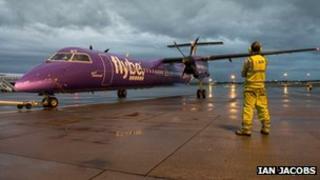 Thuirt Flybe gum faod luchd-siubhail ticeadan a bhucadh air làrach-lìn Aer Lingus, no tro reiceadair siubhail. Ri linn 's gun gabh ùghdarrasan nan Stàitean Aonaichte ri siostam tèarainteachd Phort-adhair Bhaile Átha Cliath, ruigidh luchd-siubhail na Stàitean Aonaichte le inbhe "dachaigheil". Fàgaidh sin nach fheum iad a dhol tro thèarainteachd no aonadan cuspainn aig an cinn-ùidhe.